To make our movie night extra special, we decided to go to Walmart to purchase one of their MarketSide pizzas and a few other things for our Amazing Spider-man event. 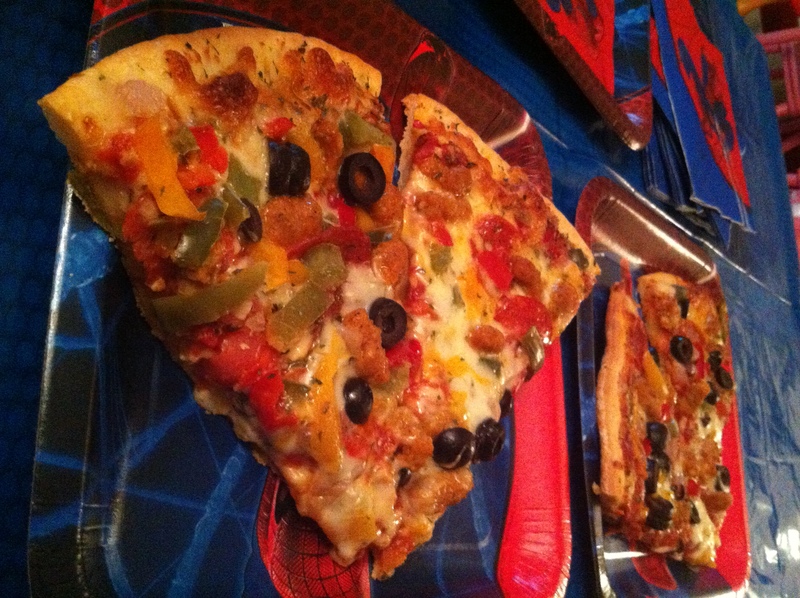 A pizza party and a fun superhero movie? I’m not a comic book geek, but even I was excited about that! We both love the MarketSide pizzas. They’re packaged like frozen pizzas, but they’re not frozen, which is why you’ll find them in a chilled section next to the deli. The pizzas are fresher than frozen pizzas, larger than frozen pizzas, and surprisingly affordable (only about $8). We didn’t need to buy a Spider-man movie because we got an advanced copy already, but we wanted to go “check out” the movies anyway. 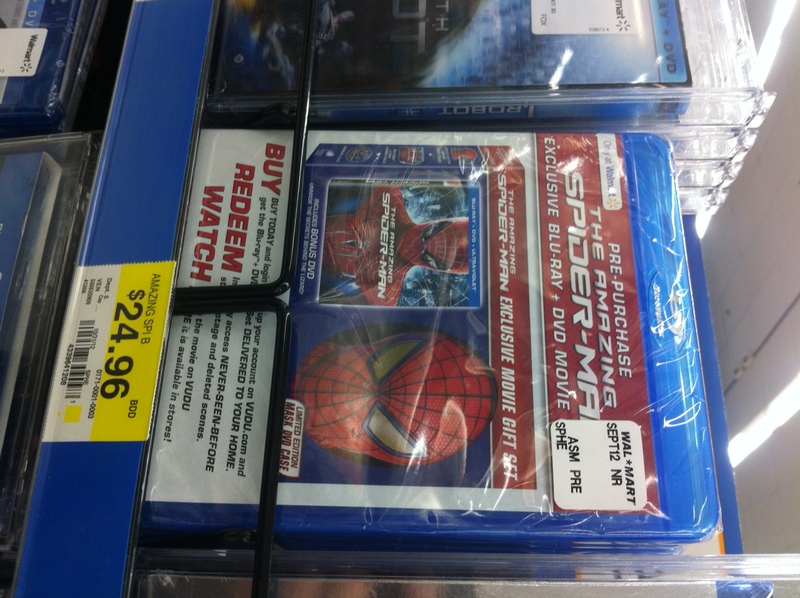 Walmart had a pre-order version of The Amazing Spider-man which included a limited-edition mask gift set! Like our MIB3 experience, the pre-order version allowed you to watch a digital copy of the movie on Vudu (at Vudu.com, of course) and receive a DVD or Blu-ray copy in the mail. It’s worth noting that Vudu uses Ultraviolet (UV), which stores your digital movies in a magical cloud so you don’t have to put them on your computer and can access them anywhere at any time. The real fun took place back at home. 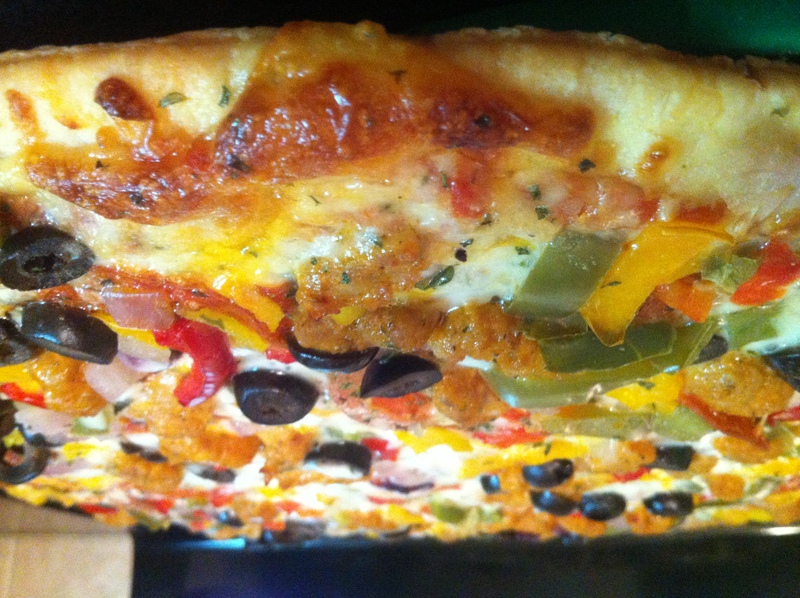 As you can see from the pictures below, the pizza looked incredible and tasted just as good. We bought some sugar cookies at Walmart and my husband surprised me by putting some spiders on them while the pizza was cooking. Isn’t he crafty?! We also picked up a Spider-man t-shirt at Walmart for our little Spider-gal (for only five bucks, how could I resist?). Here’s the part where my husband’s inner comic book geek – a side of him I was barely familiar with before now – really got excited. 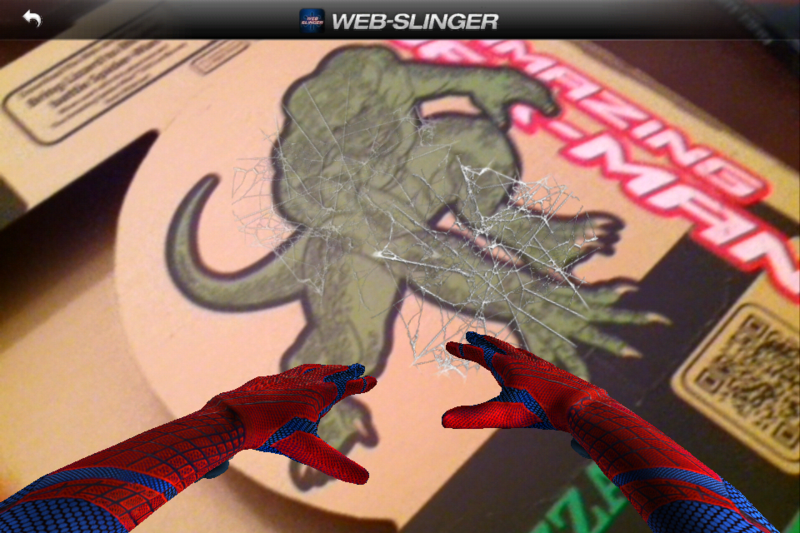 If you download the Web Slinger app on your iPhone or Android, you can activate some pretty cool “augmented reality” games by opening the app and holding your phone over the movie box or the pizza box. The web shooter pulls up your camera and allows you to shoot a “web” at objects simply by touching the screen. By opening the app and hovering over the movie, you can interact with Spider-Man and by hovering over the pizza box, you can interact with the lizard. Hover over them both and you can help Spider-Man battle the lizard! 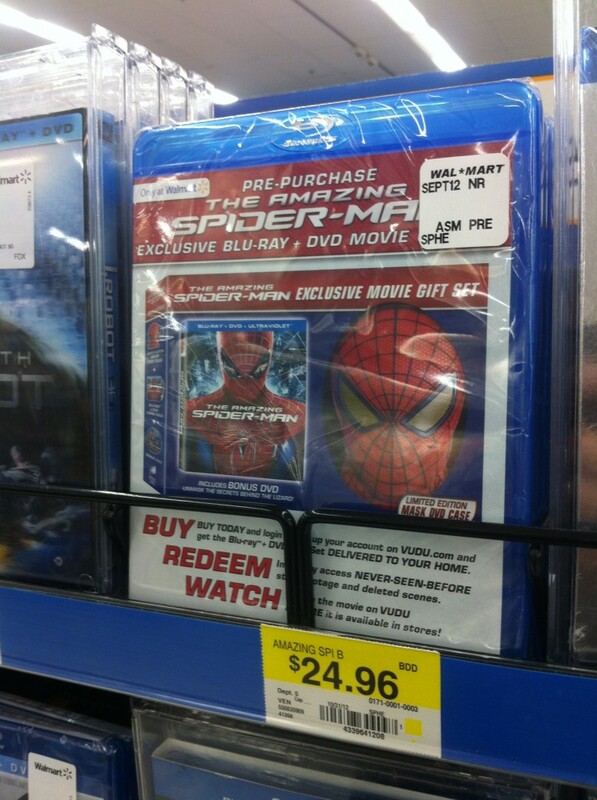 You can also put your face in a custom-made Spider-man comic book (scanning Spider-Man signs in Walmart using the app will unlock extra pages of the comic book). My husband was like a kid in a candy shop when it came to this part of our movie night experience. Playing with the web shooter! And how was the movie? The best one out of all the Spider-Man movies! Check out my Google+ album for more photos! For more information about The Amazing Spider-Man, feel free to check out the movie on Facebook, Twitter or watch the trailer below. The “Spider diva” is great! The Market side pizzas rock! We get them often! 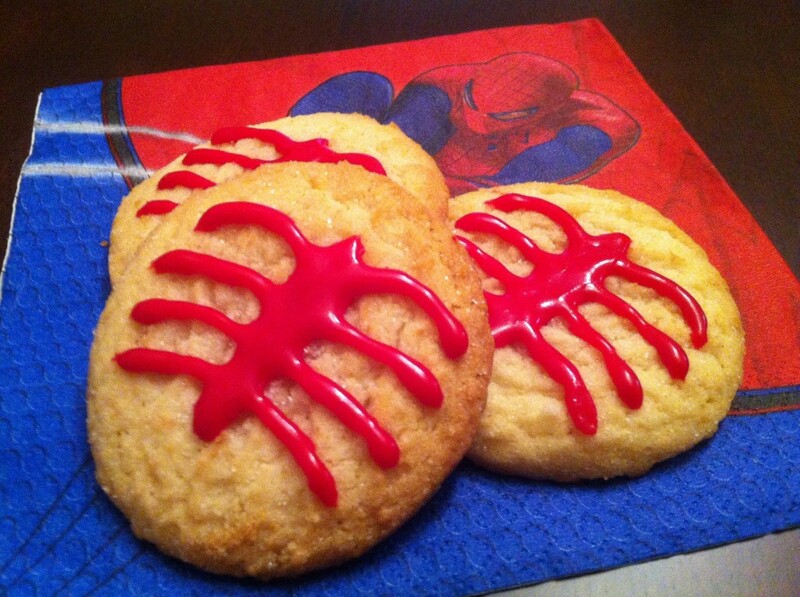 Love the spider cookies! The Market Side pizza’s are super good! Your daughter as superman is just too cute! LOL!! What a fun night! I also love your new fall motherhoodontherocks logo on the top..it is SUPER cute! Great job on the cookies! What a fun night! 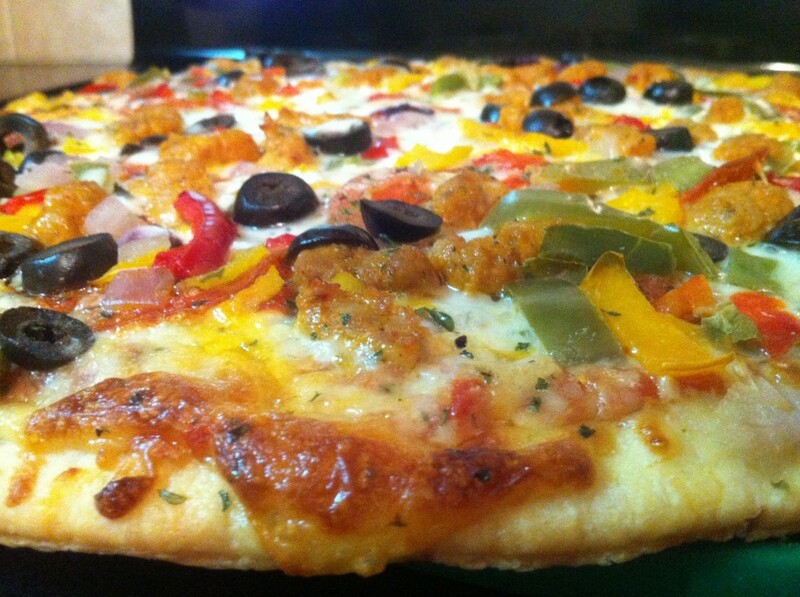 The pizza looks so yummy it is making me hungry. I love the comic with the little face. My kids would go nuts. What a great post! I have never heard of Market Side pizza. I will have to see where else this is available at…or is it only available at Walmart? I love that your husband is showing his creative side to all of this. I look forward to seeing this movie also. That pizza looks so good. I wish they had Market Side pizza around here. My son can’t wait to see the Amazing Spiderman. Love the comic book! My mom did the comic book for me and we had a good laugh! That app is awesome. THey didn’t have the app out quite yet when I bought my pre-order. I can’t wait to get it in the mail! I should not have read this before lunc….now I am starving! That’s awesome!!! I’m sitting here imaging our 6 yr old just loving all that!!! You threw a great party! This is an awesome idea! My boyfriend and I still love to watch Spider man movies and the fact that you turned it into a “Spider Man Event” is great and it looks like your kids really enjoyed it. Really creative, thanks for sharing! 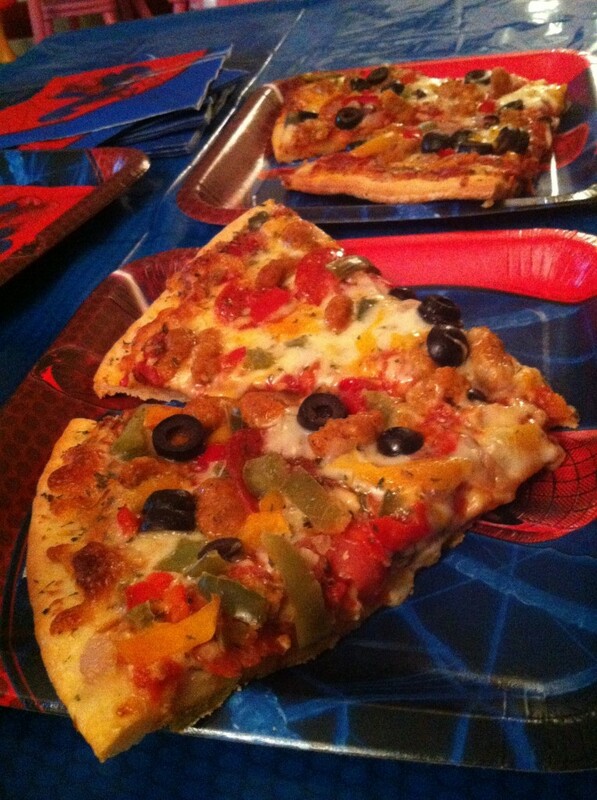 Oh so many Spider-Man (and pizza!) fans! It was such a fun night. Hope you all get a chance to check out the app and movie! I truly love both. I love this! My boys love Spiderman. I am totally stealing some of these ideas! Those cookies are so cute…and so easy! Love it.